Yesterday, I wrote about the Nike Swift Suit and Nike Track Spikes. With all the talk about the amazing comeback of Dara Torres, let’s take a closer look at those swimsuits. It’s hard to imagine a swimmer with more clothes than a track and field athlete. Swimmers in Speedos are causing a stir leading up to the Beijing Olympics, as Speedo is claiming an improvement of up to 2 percent! One has to argue if the world records are coming from psychological placebo effect and the fact that swimmers are just getting better technically in the water. The swimmers claim they feel lighter and more “compact” which produces less drag. Canadian swimmer Victor Davis used to wear two swim caps as he said it made his head feel tighter and he felt faster. Victor Davis won the Gold medal at the 1984 Los Angeles Olympics in the 200 meter Breaststroke and a Silver in the 100 meter Breaststroke. Sometimes, feeling fast is all you need. Here is a good read from Swimmers World Magazine. LOS ANGELES, California – SPEEDO, the world’s leading swimwear brand, today unveiled the special Olympic edition Team USA LZR RACER suit. Speedo worked with legendary design house Comme des Garcons to develop a one-of-kind look for Team USA featuring the red, white and blue of the American flag. The launch of the Team USA Speedo LZR RACER allows the original Comme des GarÃ§ons design to be finally revealed as the traditional gray and black silhouette has been updated with the patriotic stars and stripes of the United States of America flag. The design by visionary founder of Comme des Garcons, Rei Kawakubo, joins the distinctive metallic silver calligraphy that already appears on the suit. The calligraphy, painted by celebrated artist Inoue Yu-ichi, means â€˜kokoro’ representing the heart, spirit and mind. Though the Team USA LZR RACER suit will not officially debut until Beijing, it is being unveiled now in conjunction with the upcoming U.S. Olympic Team Trials beginning June 29th in Omaha, Nebraska. Speedo’s Team USA LZR RACER will be individually created for, and exclusively available, to all members of Team USA in Beijing. 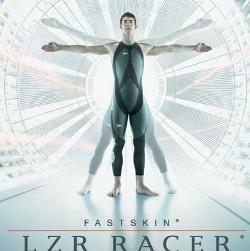 An unprecedented 38 world records have been broken by swimmers wearing the LZR Racer since its launch in February. Speedo harnessed the expertise of NASA and a number of international research institutes to create the suit which has 10 percent less passive drag than Speedo’s FASTSKIN FSII launched in 2004 and 5 percent less passive drag than Speedo’s FASTSKIN FS-PRO, which was launched in March 2007 and swimmers wearing it broke 21 World Records. Made from an ultra lightweight, low drag, water repellent, and fast-drying fabric unique to Speedo called LZR PULSE, the LZR RACER suit is the world’s first fully bonded competition swimsuit. The suit is ultrasonically welded which gives the effect of no seams at all. Ultra low drag LZR panels are laminated onto the base fabric to create a Hydro Form Compression System helping to compress the entire swimmer’s body into a more streamlined shape and enabling them to cut through the water with more power and agility. To get in the spirit of swimming, the limited edition Team Speedo USA collection is now available for purchase at www.speedousa.com.